It’s official! 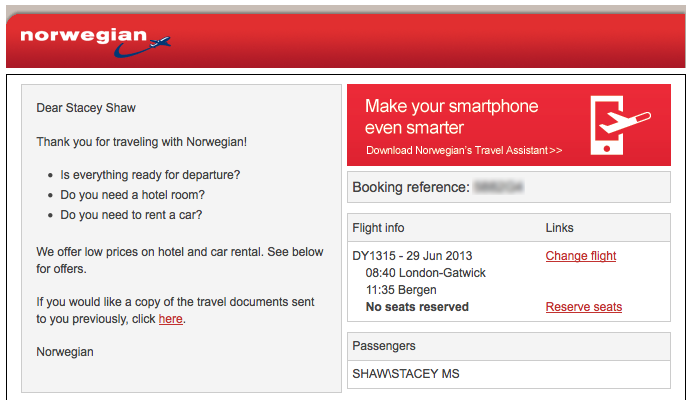 My one way ticket to Bergen is finally booked and paid for, and the best thing about it is that it cost me £35! I will need to pay for my cases but that will only be an additional £14… Cheap and cheerful, and the best airline that I have ever travelled with! I am very excited now I have this booked, and also excited at the fact B is coming back to Southampton for a few days before I move. This will enable me to move some of my things in advance and also allow us to spend some time together here too. We already have a lot of things planned; dinner at our favourite Caribbean restaurant Coco Rio, a visit to Bristol to see my lovely friend Nicole and some other stuff too! The Norway job hunt continues… I’m trying to stay optimistic as I am aware it will be difficult for me to find a job prior to me moving. However, there is no harm in me looking and trying! My CV is all completed and it’s looking very snazzy! I figured in order for me to stand out from the crowd, I had to create it in Photoshop and do something different. Fingers crossed it will get me noticed. ← Out With a Bang!